Microsoft made a big deal of building 3D printer support into Windows 8.1, and today it's releasing a tool that lets even newcomers create objects of their own. 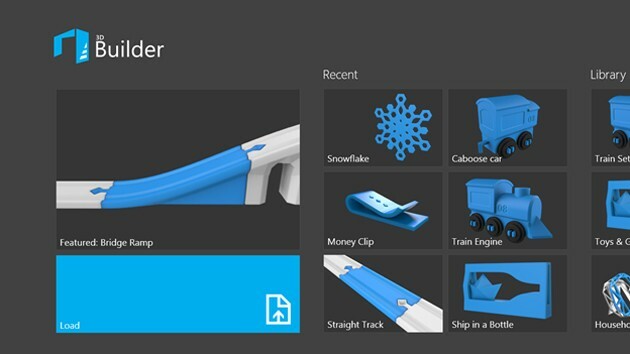 The new 3D Builder app includes a catalog of pre-designed items that virtually anyone can start printing right away. Especially curious users can adjust and combine objects without having to be a CAD expert, and those with access to more advanced tools can import their masterpieces. As long as you've already shelled out for the requisite printer, you can try 3D Builder for yourself at the source link. Ashley Madison — the dating site for married cheaters — is being sued by a woman who claims she hurt her wrists writing its bogus profiles. However, she never alleges the bogus profiles are illegal, as our Jim Edwards has noted. So are bogus profiles on a dating website illegal? Business Insider spoke to Eric Goldman, director of the High Tech Law Institute at Santa Clara Law to get some insight into Ashley Madison's bogus profiles. It turns out they may be in a legal gray area. That's because Ashley Madison actually discloses in its terms of agreement that some of its "Ashley's Angel's" profiles may be "fictitious." Here's what the terms say about "Ashley's Angels:"
The purpose of our Ashley’s AngelsTM is to provide entertainment, to allow you to explore our Services and to promote greater participation in our Services. Ashley’s AngelsTM attempt to simulate communications with real members to encourage more conversation and interaction with users. We also use Ashley’s AngelsTM to monitor user communications and use of our Service to measure compliance with the Terms. Further, we may use Ashley’s AngelsTM in connection with our market research to enable us to analyze user preferences, trends, patterns and information about our customer base. Ashley’s AngelsTM are not intended to resemble or mimic any actual persons. These user terms could enable Ashley Madison to successfully argue that it was being upfront about being just "a fantasy" and "a fiction," Goldman told us. If users are just pa! 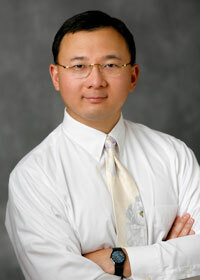 ying for the fantasy, then the site could argue they're "getting exactly what they're paying for," Goldman said. However, Ashley Madison may get into trouble if somebody can prove its marketing pitches let on that users are getting more than a fantasy. "You can't disclose in the user agreement things that conflict with their basic marketing pitches," Goldman said. Dating sites have been sued in the past by users for allegedly promoting bogus profiles. Yahoo Personals and Match.com have both been sued by disgruntled users who claimed they kept inactive profiles on the sites to make it look like they had more subscribers than they actually did. Ashley Madison — and other sites with fake profiles — may face enforcement actions from the Federal Trade Commission, which has been more aggressive lately about fake content online, according to Goldman. "They [the FTC] hate the idea that there is fake information on the Internet," Goldman said. "In my mind this is just another extension of inauthentic content online." For its part, Ashley Madison owner Avid Life Media said in a statement provided to Business Insider that its service is "100% authentic, as described in our terms and conditions." "We stand by our product so much that we offer a 100% guarantee if service does not meet every expectation," the company said. 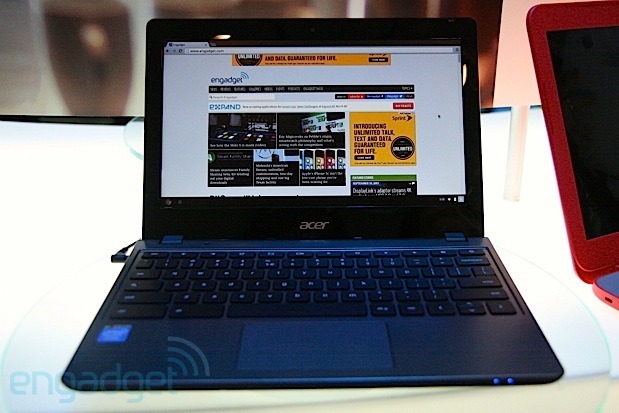 Acer gave its Chromebook line a welcome tune-up when it launched the Haswell-based C720, but the $250 starting price was no doubt disappointing to those who wanted the C7's $200 entry point. The company is accommodating those spendthrifts today with its $200 C720-2848 variant. The only sacrifice is a lower 2GB of RAM; owners still get a 1.4GHz Celeron processor, a 16GB solid-state drive and that vaunted 8.5 hours of battery life. Should you want to save a cool $50, or are just frustrated that you can't buy a Chromebook 11, you can pick up the new C720 today from Amazon or Best Buy. Sears to convert old Auto Centers into... Data Centers? 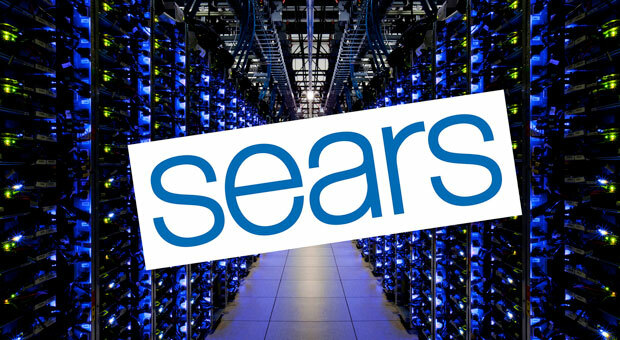 You can buy pretty much anything from Sears, but we doubt it's your first-choice destination for server capacity. That's likely to change if Ubiquity Critical Environments, the company's IT infrastructure arm, gets its way. The outfit is considering turning old Sears Auto Centers into server farms that'll offer services to mission-critical IT projects for enterprise customers. Guess it's high time we learned how to do our own oil changes. 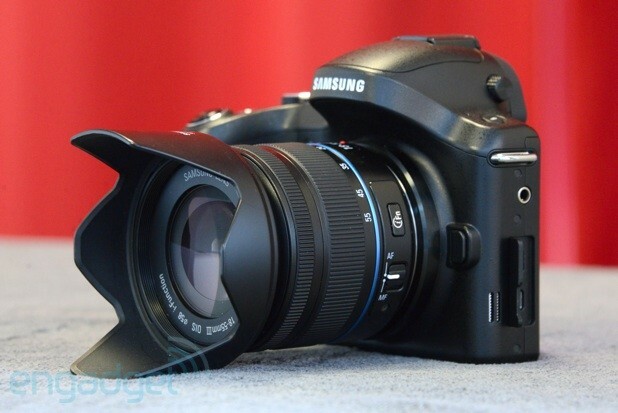 Samsung's flagship interchangeable-lens camera, the NX300, is by far the company's most impressive shooter to date. It offers stellar hybrid-autofocus capabilities, excellent image quality and integrated WiFi, and it retails for a hair over $550. For all intents and purposes, it's a very competitive option, if not one of the best deals on the market today. It's frustrating, then, that Samsung opted to price the Galaxy NX -- an Android-powered camera based on the NX300 -- at an obscene $1,700, lens included. If you're not a deep-pocketed early adopter, it's absolutely a dealbreaker. But I still enjoyed my two-week test with the Galaxy NX, and if you manage to overlook the MSRP, you might just fall in love. There are two systems to consider when evaluating the Galaxy NX's hardware: the 20.3-megapixel APS-C CMOS sensor and DRIMe IV image processor, and the 1.6GHz quad-core Pega-Q chipset that keeps the Jelly Bean (4.2.2) operating system purring at an entirely usable pace. The NX is first and foremost a camera, and it's a powerful one at that, and smartphone chips, like WiFi, LTE and HSPA+ radios, and a virtually unlimited array of apps, transform this otherwise ordinary mirrorless model into a robust connected beast. Shape and size aside, the NX is aesthetically more akin to a smartphone or tablet. There are far fewer buttons and dials than you'd expect to find on a camera -- instead, all settings are adjusted from within the Android camera app, which you'll access through the 4.8-inch, 720p, touch-enabled LCD. There's also a 0.46-inch SVGA electronic viewfinder, which outputs a more traditional preview screen, with information like aperture, shutter speed and ISO. 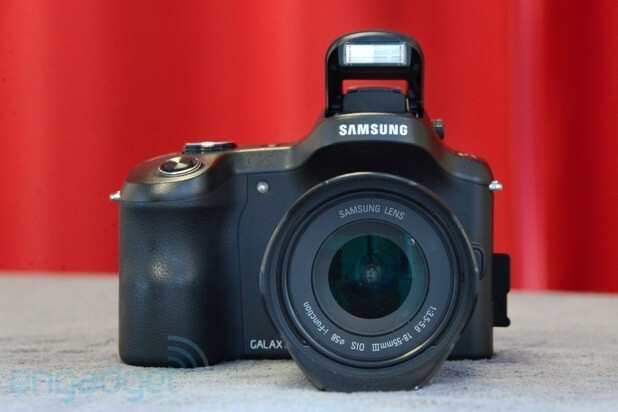 From the front, the Galaxy NX looks like any other EVF-equipped mirrorless camera. It's taller, wider and heavier than most similarly specced models on the market today, but not uncomfortably so. There's a lens release and focus-assist light flanking the 18-55mm f/3.5-5.6 kit optic around front, then a pop-up flash (with release), hot shoe, microphone, power button, control dial, video record button and shutter release up top. On the left side, you'll find a standard headphone jack, a micro-USB port (which you'll use to charge the camera) and an HDMI port. 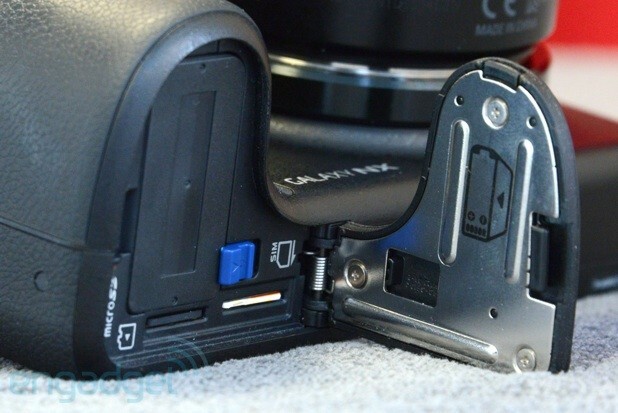 The bottom contains a tripod mount and a large door covering the micro-SIM, microSD and battery compartments. All three components, including the relatively massive 4,360mAh cell, slide in behind the large extended grip. You've got the full power of Android at your disposal, which means thousands of compatible photo apps to play with. You can install applications to add funky effects to your photos, organize stills and video clips or share your shots with friends. And if you're considering the NX as a newsgathering tool, it is theoretically possible to instantly upload full-res frames directly to the cloud from anywhere in the world. And unlike other Android-powered cameras, like the Galaxy S4 Zoom, the NX features a manual zoom lens, so you can zoom in and focus in any app. I shot exclusively with the Galaxy NX during a two-week journey around the world. I lugged the camera through Zurich, Tokyo, Taipei and Shanghai every day of the trip, staying online with an unlimited global SIM from KeepGo. That latter bit of technology enabled flawless connectivity everywhere I traveled, letting me use the device dangling around my neck to navigate city streets, respond to email and, of course, share dozens of high-quality photos and videos on Instagram seconds after they were shot. Most of the time I left my smartphone at the hotel, relying on the NX and its fantastic battery to help me navigate each city as I uploaded photos in real time and kept in touch with the office while 8,000 miles from home. But the moment I returned to New York, the Galaxy NX went into a drawer and didn't re-emerge until I began working on this review. While the NX was a great fit for that two-week tour, it's just not very practical at home. And that makes sense. Snapping a casual photo every other day was much easier to accomplish with a traditional smartphone, and if I'm not exploring a new city, there's really no need to capture images with a fantastic camera. Worse yet, however, is the fact that Android ultimately serves to complicate the shooting process here. There's a hardware dial up top, but you need to unlock the NX and launch the camera app to tweak any settings. 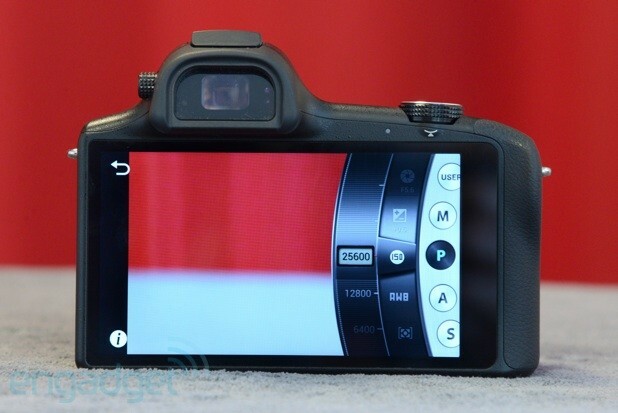 The interface is nearly identical to what you'll find on the GS4 Zoom, and it's not great. You can select from "expert" options like aperture and shutter priority, or a full manual mode, but the process of tweaking ISO and exposure is far more cumbersome than on a traditional mirrorless camera or DSLR, where dedicated dials and immediately accessible options make on-the-fly adjustments more straightforward. Of course, if you're shooting through a third-party app, you'll need to depend on that UI for any exposure adjustments. Generally you'll be limited to automatic mode, without an option to change ISO or take advantage of any of the "Smart" options, like Rich Tone or Action Freeze. You can theoretically shoot from the native camera application, save images to the gallery and access them later through another app like Twitter or Instagram, but a bug in the software version I reviewed made sharing full-res images from the gallery impossible. Samsung is looking into the issue, however, and I imagine a fix is in the works. As a workaround, I used a generic Android app called "Images easy resizer" to scale down images and save a copy, at which point I was able to access them through Instagram and Gmail. Settings adjustments aside, the Galaxy NX did a fantastic job in camera mode. It was also very reliable when it came to accessing email, uploading and viewing images, sharing social media updates and even helping me wake up in the morning (there's a speaker and vibration mechanism, which pair nicely with the alarm clock app, just like on a smartphone). It served me well during this vacation, but to take full advantage of Android, you'll need to use the camera daily, even at home. After having it powered off for a couple days, I returned to find dozens of Twitter, Instagram, Hangouts and Google Voice notifications. While they're easy enough to dismiss, it's still a process that I'd prefer to avoid. Of course, one of the biggest issues with using a camera that runs Android is a delayed start-up. When it's completely powered down, the NX takes a reasonable 28 seconds to boot up before you're ready to snap your first shot. Fortunately, a short press of the power button simply turns off the display, just as it would on a phone, and launching back into the camera from standby takes less than five seconds. In this regard, it's certainly not as speedy as a traditional ILC, but depending on your subject, it should do the trick. You can also configure the NX to jump right into the camera app whenever you press the shutter button, so if you see something you'd like to shoot, but you're currently sending an email or reading a webpage, it's easy enough to switch modes for a moment. 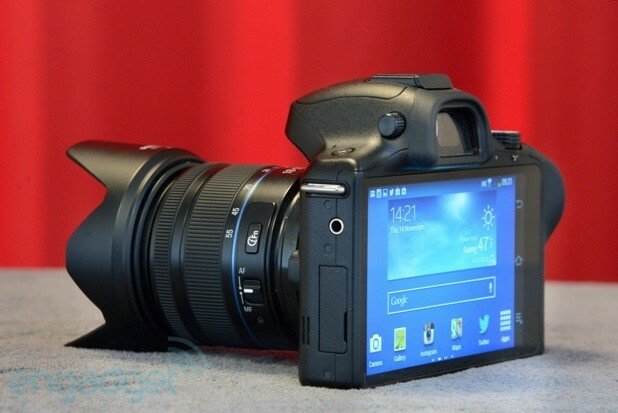 Just like the NX300, the Galaxy can snap continuous shots at eight frames per second. It also sports an identical hybrid-autofocus system, and adjustments there are consistently speedy and accurate, even in low light. 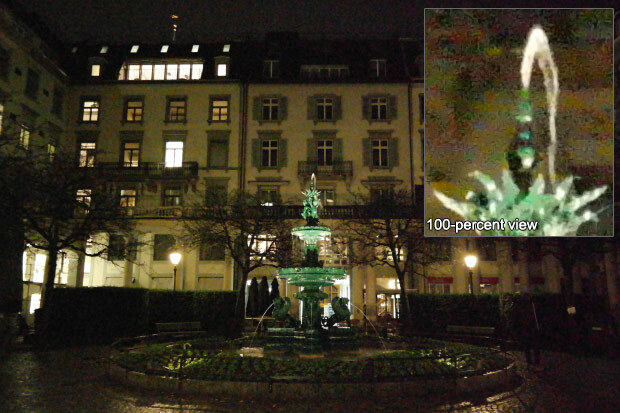 Nighttime shooters will also be pleased to know that the NX can snap stills with a sensitivity of ISO 25,600 -- we'll speak to those results a bit more in the section below, but it's definitely a possibility, especially when you're capturing images to share on the web. You can also shoot stills in RAW. On the video front, expect 1080p video at 30 frames per second or 720p at 60 fps, with generally solid audio capture, too. Battery life is phenomenal. After deplorable performance with last year's Galaxy Camera, I was definitely concerned about the NX making it through a full day. In practice, however, I had nothing to worry about, as long as I charged the battery overnight. While shooting on Halloween, I spent the day exploring Shanghai, returning to the hotel nine hours later with a 32 percent charge remaining. When you factor in the Google Maps browsing, emailing, Instagram sharing, Foursquare check-ins, 128 photos and nearly three minutes of 1080p video I was able to capture along the way, that's solid performance. Of course, I'd expect nothing less from a 4,360mAh battery pack, but it's great to see that Samsung planned ahead here. 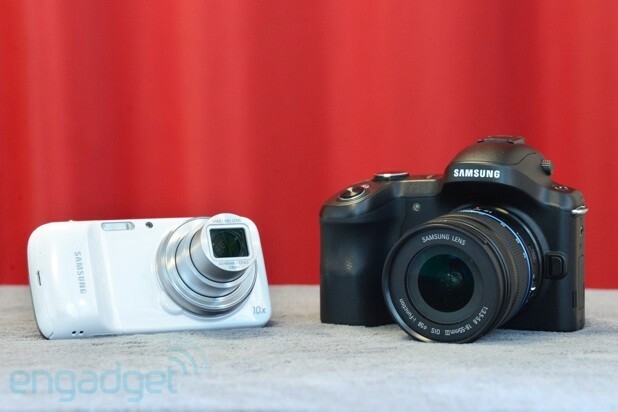 IQ-wise, the Galaxy NX is an NX300 through and through. That means image quality is top-notch, and more than adequate for the casual shooting you'll probably be doing. In fact, if the interface wasn't so cumbersome and the camera body so large, I wouldn't hesitate to switch to the NX for all of my important shoots at trade shows and launch events. It's really that great. Let's take a look at some samples. 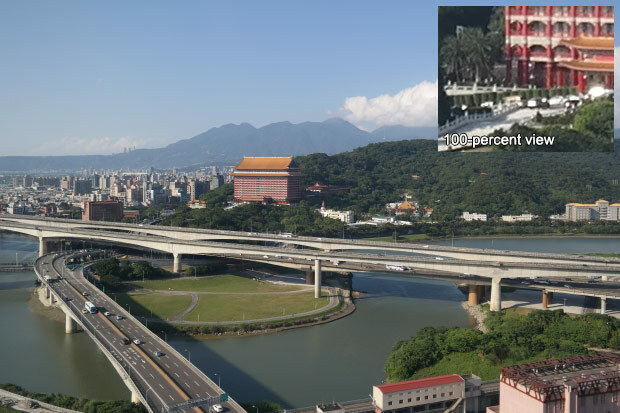 This shot of the Grand Hotel in Taipei was captured just before landing at Songshan Airport. The camera was set to auto mode, and opted for a perfect exposure of 1/250 second at f/6.3 and a sensitivity of ISO 100. The image looks perfectly sharp until you zoom all the way in, as you can tell from the 100 percent view in the top-right corner. Even so, while perfectionists may have opted for a higher-quality lens in order to capture even more detail, this frame is perfectly adequate for prints or sharing on the web. 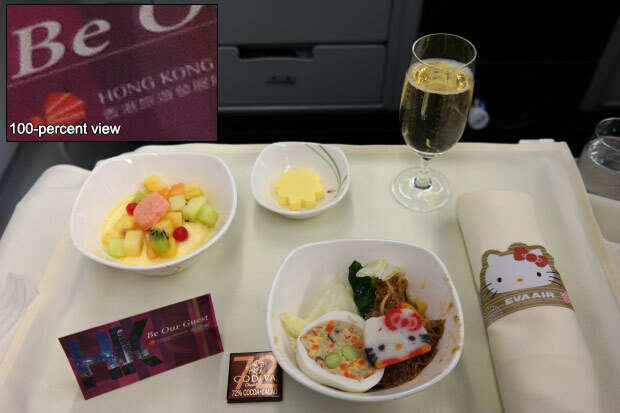 Food can always present a challenge for even the most capable camera, but the Galaxy NX did a fair job exposing for the uneven lighting on this EVA Air flight between Tokyo and Taipei. Colors and sharpness look great in this 1/50-second, f/4 shot, captured with a sensitivity of ISO 400. It was a rainy day in Zurich, but the NX didn't seem to mind. Colors are vibrant and details are fantastically sharp in this 1/80-second, f/5.6 exposure at ISO 800. There is some mild blooming around the text in the 100-percent inset, but you'll only notice it with a 1:1-pixel view on a computer monitor. 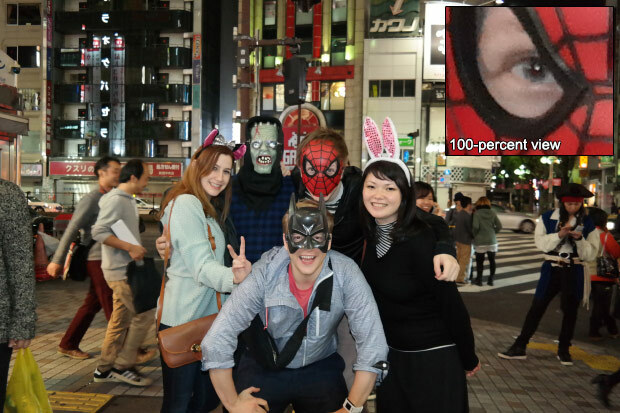 The Galaxy NX had quite a night in Tokyo, as you'll probably gather from the slideshow below (and the full-res samples at the source link way down at the bottom). This group shot was captured at 1/50 second with an aperture of f/3.5 and a sensitivity of ISO 3200, but it looks fantastic, even when viewed at 100 percent. Judging from the 100-percent inset, ISO 25,600 presented some challenges for the Galaxy NX, but even the most capable of smartphones wouldn't have been able to snap a shot with this level of sharpness and detail. A 1/30-second exposure at f/3.5 helped to minimize blur, and all things considered, this is a perfectly respectable performance. 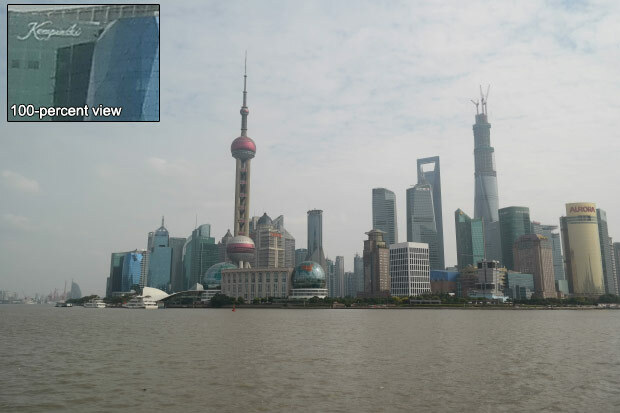 I opted for the NX's "Rich Tone" (HDR) mode when photographing the Shanghai skyline. There was plenty of haze in Pudong, but the camera still did a decent job capturing detail. 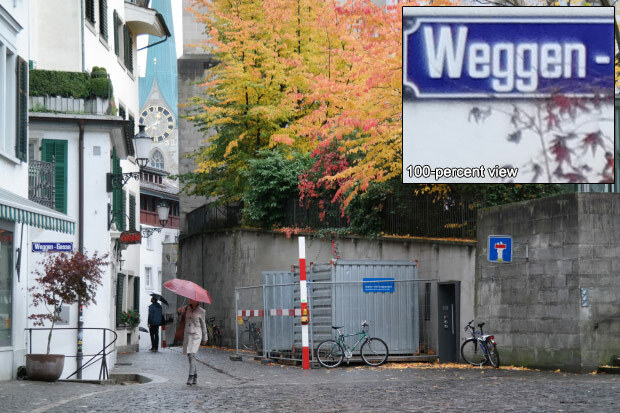 You can even make out some hotel names in the distance, such as Kempinski in the inset above. Since this was an auto-HDR shot, we don't have exposure information to share, but the NX performed well given the circumstances. One advantage of shooting with a touchscreen-equipped camera is that you can take full advantage of Samsung's "Beauty Face" mode, which blurs skin and shrinks heads to make your subject CoverGirl-ready. 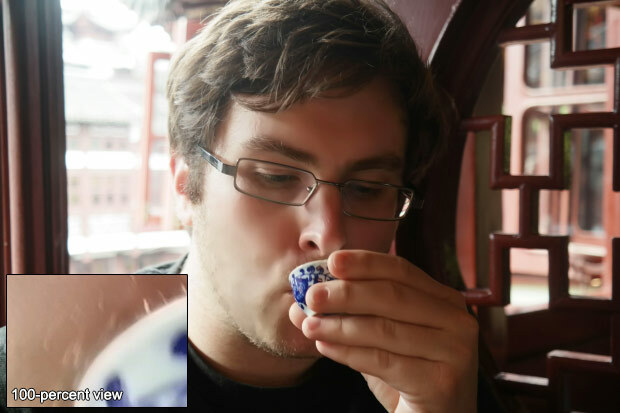 It struggled a bit with my unshaven face, but it's still a fun tool to play with -- especially when you've put on a few pounds after a week of street noodles and buffet breakfasts in Asia. It's safe to say that there's no other Android-powered interchangeable-lens camera, so if that's what you're after, you can look no further than the Samsung Galaxy NX. On that note, if you're here for Android, but you're concerned about the NX's size, you might consider the Galaxy S4 Zoom. But be warned: The Zoom is based on a sluggish chipset, so if you're planning to multitask and use that device as your daily driver, it's not a fantastic fit, either. On the traditional mirrorless-camera front, you can do a heck of a lot better for only $300 more. Sony's brand-new Alpha 7 packs a full-frame sensor and a decent kit lens, and it's shipping soon for $2,000. 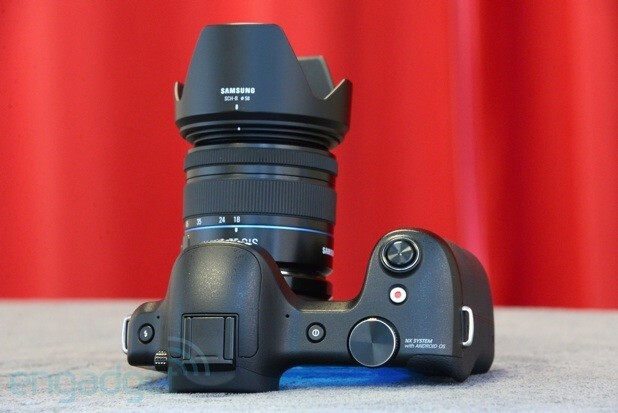 Of course, Samsung's NX300 is an obvious pick, too, and at just $550 with a 20-50mm lens, you'll have enough cash left over to pick up just about any smartphone on the market, without a two-year contract, and treat your family to a night on the town to celebrate your fiscal responsibility. Or you can use the leftover dough to fund a flight to China for you and your brand-new (and reasonably priced) ILC. 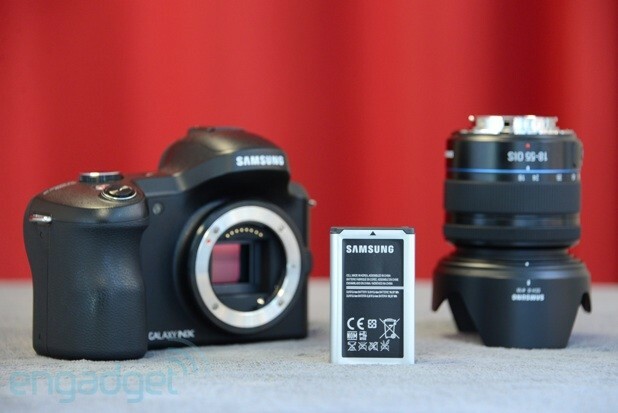 For a first-generation product, Samsung's Galaxy NX really isn't half bad. It's an excellent photo- and video-capture machine, and it even works well as a portable Android device. Sadly, it misses the mark when it comes to integration -- even if sharing photos between apps worked as advertised, it's ultimately nothing you can't do with a WiFi-enabled ILC or point-and-shoot, or even an add-on lens camera like Sony's compact and cheap QX10. If you're curious about the Galaxy NX, head over to a camera store and try one out for yourself, but we can't in good faith recommend that you spend $1,700 on this overpriced hybrid, even if you have the cash to spare. Why does it matter that Apple only has a sliver of the smart phone market? After all, it's earning the majority of the market's profits, right? So, what's the big deal? Well, the reason smart phone market share matters is that in technology, profits tend to accrue over time to the dominant platform. What happens is one platform becomes the standard, and developers focus their attention on that platform. As they focus on that platform, they abandon the other platform, and it becomes a second tier player. When that happens, consumers become less interested. So far, the iPhone, even with a small share of the market has been the most popular for developers. That may be about to change. 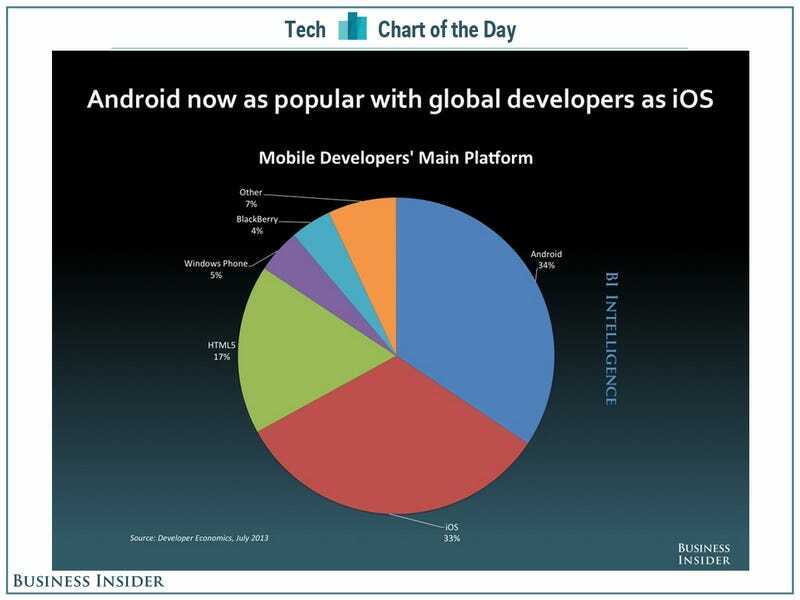 This chart from BI Intelligence shows that developers around the world are switching their focus to Android. If this pattern continues, then the big fears about market share could be realized and Apple could turn into a second tier platform as developers work on iOS second. Say what you want about the long-term viability of Bitcoin, the digital currency that's been going crazy lately. Bitcoin has been incredibly lucrative for Sam Cole, Marcus Erlandssona and Andreas Kennemer. Because of Bitcoin, they made $3 million in just four days. Their company, KnCMiner, doesn't own Bitcoins or trade them. They make the special computers that allow people to "mine" Bitcoins from cyberspace. From November 7 to 10, 2013, while Bitcoin prices were climbing wildly, Stockholm-based KnCMiner sold out of its newest Bitcoin computer, selling 5,000 units. These computers cost $7.000 a piece (and yes, they take Bitcoin as payment). At one point, the computers were selling so fast that KnCMiner generated $600,000 in less than five minutes, it said. That's because there's basically three ways to get a hold of a Bitcoin. You can buy them. You can take them as payment for products or services. You can go out into cyberspace and create them, otherwise called "mining." Mining a Bitcoin is hard for a typical computer to do. A computer has to solve a series of difficult cryptography problems and most computers don't have the computational power to do that. So companies like KnCMiner developed special Bitcoin computers using custom computer chips. (Such chips are called ASICs which stands for "Application-Specific Integrated Circuit.") These computers do only one job: mine Bitcoins. 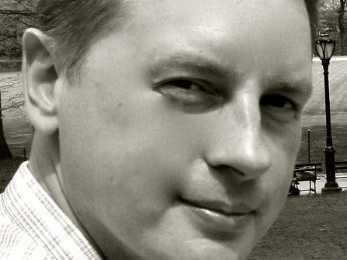 We asked cofounder Andreas Kennemer about the business of Bitcoin computers. Business Insider: How is a Bitcoin "mined"? Andreas Kennemer: Bitcoins are built from cal! culating an algorithm (or encryption problems) called SHA-256. By using the processing power from your ASICs or graphic cards, you try to solve the algorithm (called "solving a block") to create new Bitcoins. If you succeed in solving the algorithm, your result is verified by the other processing “computers” in the Bitcoin network. If you are the lucky first to solve a block you get rewarded with Bitcoins, currently 25 per block. The algorithm also keeps track of how many Bitcoins are allowed to be created. If the creation exceeds more than 3600 Bitcoins a day, the difficulty to create Bitcoins increases. This means that it gets harder for the computers to solve a block and the amount of Bitcoins that can be created remains the same. BI: What's different about a Bitcoin computer from a regular PC, like a high-end MacBook pro? Or a "supercomputer"? AK: A Bitcoin computer has an ASIC chip specifically designed for calculation of the Bitcoin algorithm (SHA-256). This computer has only one task and can only perform that task. Because it is specifically designed for that purpose, it can calculate the Bitcoin algorithm extremely fast compared to a [regular computer] CPU or a graphic card. We have spoken to Chinese engineers running the world’s strongest supercomputer in China. If that supercomputer were to calculate the Bitcoin algorithm, it would be the equivalent of 40 of our Jupiter models [550 gigahashes per second, gh/s, or 550 billion computations per second] to be equal in performance. BI: How fast can one of your top computer mine bitcoins? AK: Current average mining speed of our fastest model (Jupiter) is 0.6 coins a day per device. BI: Are serious Bitcoin minors also using supercomputers to mine? AK: No, those computers can’t compete with our devices. The ASICs are specifically designed for calculation of the SHA-256 ! algorith m and the cost-per-Gigahash (calculation power) is much lower.